Could it be possible that London is the best place to eat French? Three Chefs re-invent the French Classics for us. Leave France to step back. It's exactly what the Pascal Aussignac did when he left France and created 5 years ago, next to Smithfield, Le Club Gascon with Vincent La Berry. " What we wished was to defend our South-West origin abroad, in a spirit which was both traditional and modern. Londoners, because of their cultural melting-pot, are much more sensitive to all foreign influences, and much more receptive to new things than the French who often have some very strong pre-conceived ideas about French cuisine." The originality of the "Club" is principally its small dishes, served like tapas. Customers choose from a wide variety of dishes going from the classic `Toulouse Cassoulet' to the more surprising `Foie foie gras fumé au Cigare' (Foie gras smoked with Cigar), beer and Armagnac Sorbet'. Four or five dishes are enough to create a meal. The waiter will advise you about the order in which they should be served, their format according to their taste and how they marry with each other. " The basis of the idea was that although we wanted to offer South-West dishes, our market was mostly business men who were not likely to eat very rich food. The solution therefore was to serve very small portions." By re-inventing the way in which these traditional dishes are served, Le Club Gascon was awarded its first Michelin Star in 2002. Could it be possible that the cuisine of the Ancient Kingdom of Aquitaine has taken some interesting new directions on English soil? The affinities between the two regions, we know, are part of history. La Trouvaille is another example of what can happen. Situated near Carnaby Street, La Trouvaille's menu emphasises South-West dishes. Its secret however is based on local produce. The Chef, Sébastien Gagnebé, is keen to stop this idea that we don't eat well in England: "What makes me angry are the chefs who only swear by French produce. All my produce is English but my cuisine is French." Sébastien Gagnebé is originally from Sarlat. He trained first of all at The Petit Blanc in Oxford and at Loafers in Clapham. He has succeeded in a very short period of time to establish for himself a network of small producers, mostly from the Lake District. If "La Bavette Sauce Savora" (Undercut with a Savora Sauce) is 100% Galloway, `Le mouton à la lavande' (Lavender Lamb) is Herdwick, the wine is most definitely from the South-West vineyards. "We didn't want to serve Bordeaux or Burgundy because everybody knows them. The spirit of La Trouvaille is to offer new things without being completely mad, summarises Thierry Bouteloup, ex La Poule au Pot ou created La Touvaille with Jean-Charles Adam. 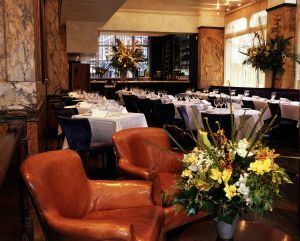 The restaurant was opened in 2001 and with a very inventive cuisine and very good value for money has rapidly succeeded in getting a good reputation for itself amongst the `connoisseurs'. Let's now think cassoulet but not the usual one, this time, with a touch of India or more precisely with a Pondichéry sauce. La Porte des Indes, situated at Marble Arch, offers a range of dishes inspired by the French Indian Cuisine. `Le cassoulet de Fruits de mer' (the Sea food cassoulet) is something of a bouillabaisse with hints of cocoa and Indian spices. The careful elaboration of the menu has taken le Chef Mehernosh Mody, a number of times to Pondichéry, a French colony until 1954. There he went to meet the last Franco-Pondichery ladies who both lived and cooked during this colonial period. Amongst them, Lourde Swamy who has bequeath to him her "Magret de Canard Pulivaar' (duck Pulivaar) recipe with Indian spices. " Given that most of these women did not really keep a recipe notebook, I had to spend a lot of time trying to re-create the taste of some of these dishes or at least a certain amount of time to get as close as possible to what they must have tasted like, explains Mehernosh Mody. For instance, to re-create the `Vadovan', which is made with about ten different spices, it took me about 4 years experimenting before getting there". The menu is truly a journey in itself. It takes you on a voyage and of makes you discover an unknown Exotic French cuisine. Not to be missed: `The Cercle' will soon open in the Chelsea area. It will be a type of brasserie-restaurant where people from the area will be invited to come and relax with friends around some French dishes served in the same way as in the Club Gascon. Le Cercle opens its doors mid-April at Wilbraham Place, SW1. 32 seats + a private room for up to 20 people. Suggestion: `Le confit de canard à la réglisse et panais', tender and gently caramelised. For dessert, go for `Le cannelé bordelaise', light custard with chicory: crispy on the outside and soft and light on the inside. End your meal with a small glass of Armagnac Liqueur from the Lacquy Estate. Exquisite. The little extras: The decoration of this old ball room is in itself enough for you to want to go: Fresco similar to Douanier-Rousseau, Ja�pur stone banister, marble staircase, antiques all of which have been directly imported from India. A waterfall links both levels whilst on the ceiling three glass domes give natural light to the whole place. Not to be missed: `The Governer's room', directly inspired from the colonial era: Ocre, a very popular colour in Pondichéry, dominates. On the wall, a portrait of Charles de Gaulle and some French flags don't leave any room for any ambiguity about the spirit of the place. Yet to come: In the autumn, Chrysalis publishes a book on La Porte des Indes recipes. La Porte des Indes opens in Paris, after Brussels in 1991 and Londres in 1996. Paris should perhaps get inspired by the Indian influence.